It was a sunny day in 1936, in southern Siberia, not too far from the Sayan Mountains, north of the Russian border with Mongolia. On that day, like many others, the fields needed tending to, and Karp Lykov and his brother were out working together like they usually did. The Lykov family was part of a devout Orthodox Christian sect known as the ‘Old Believers’, which dates back to the 1600’s. As the persecution of all Christians intensified under the brutal regime of Stalin, many of the Old Believer families had moved to rural communities in Siberia to live in peace. They quickly gathered what they could carry, a few tools including an axe, a couple of metal cooking pots, and a small collection of garden seeds. Most precious to them was their illegal family Bible and illegal prayer books, any of which could carry the death sentence at the whim of Stalin’s thugs if they were caught with them. With only what they could carry, Karp and Akulina Lykov then fled with their two children deep into the endless boreal forests of the Siberian wilderness. Following rivers, the Lykov family built shelter after shelter, each further out, eventually penetrating deeper into the wilderness to a spot they could finally call home. It was on a hillside in mountainous terrain next to a tributary of the Abakan River which was so remote and unexplored it didn’t even have a name on the map at that time. They were about 250 kilometers (155 miles) from the nearest human settlement, and now they could live in peace and freedom. It was a hard life, for they were pioneers in the purest sense of the word. 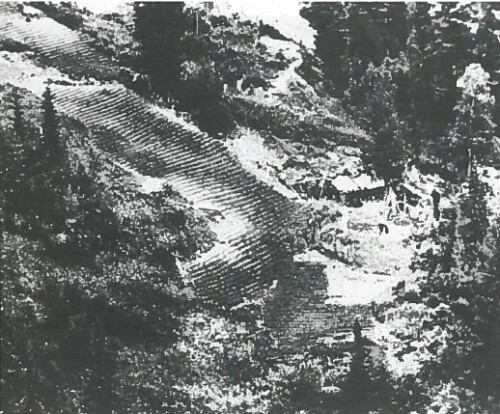 They cleared a patch of trees on the hillside and planted a large garden. Their garden provided their staple food crops of potatoes, carrots, peas, hemp seeds, and rye. They rotated crops from one location in their cultivation area to another area every three years. They also gathered mushrooms, bilberries, raspberries, and pine nuts. The river provided fish which they ate and dried any extra. To store dried food and seed they fashioned storage containers out of birch bark. Akulina gave birth to two more children at their wilderness homestead. In 1940 she gave birth to another son, Dimitry, and in 1943 she gave birth to another daughter, Agafia. Akulina Lykov taught her children to read using the Gospels in their outlawed family Bible. She taught them to write using birch bark as paper with sharpened birch sticks as pens and with ink made out of honeysuckle. Their clothing and shoes began to wear out, and they patched, and patched again till their clothes just fell apart. As their clothing situation worsened, they made a primitive loom out of wood and used it to make cloth from the fibers of their hemp crop. They fashioned shoes during the winter out of birch bark, and in warmer weather their feet grew tough as they often went barefoot. In the 1950’s, the two boys, Sevin and Dimitry, grew old enough and had become good enough woodsmen that they began hunting and trapping wild game without the aid of steel traps, guns, or even a bow and arrows. Growing up in the wilderness, the boys grew into men with a massive level of endurance, stamina, and resistance to cold. Often they would hunt by chasing large game to its exhaustion and then killing it with a knife. They also trapped large game like elk in pits they dug which were typically about three meters deep and three meters on each side. Their metal cook pots lasted for many years but eventually rusted out. They then had to cook in birch bark containers with heated stones, or make potato patties with hemp seeds and ground rye on hot rocks near the fire. The weather and depredations by animals were constant threats to their all-important garden. Animals wiped out their entire crop of carrots one year. The weather got rough in the late 1950’s which they referred to as the ‘hungry years’. The family never forgot their faith, always studying the Bible, and never neglected taking time for prayer and worship. The parents also educated their children as best as they could about the outside world. The children grew up knowing about cities and modern technology, at least in an abstract sense. Their principle entertainment through the years was for everyone to recount their dreams to each other. They had also all grown close to nature and they often spent a lot of time gazing out at the stars at night. They knew the stars as well as any navigator. Even though they didn’t know what a satellite was, they could see them and they knew they were something new and different. Karp correctly assumed they were probably something manmade. In 1961, disaster struck. After planting their crops, it unexpectedly snowed in June and the hard frost killed everything in the garden. That winter, Akulina Lykov chose to starve to death so her family could have enough food to survive till spring. By spring, the remaining five family members were eating boiled bark to survive. In the spring of 1962, a miracle happened, a lone rye plant sprouted, and they posted a 24 hour guard on it. At harvest time that lone plant gave them 18 seeds from which to start rebuilding their rye crop. A couple of other crops managed to have enough seed left in the house or in the field to rebuild their garden from, most notably potatoes and hemp. As the children grew older, each took on distinct roles within the family. With their mother gone, Natalia, the oldest daughter, took over the role her mother had as the seamstress, cook, and medic for the family. Sevin, the eldest son, was becoming the spiritual leader of the family. Dimitry, the master outdoorsman, was born in the Siberian Taiga and he knew the moods and seasons of the boreal forest like few other humans. He was also the craftsman, making boards from logs with only an axe, and he built the family a new stone hearth in their cabin. Agafia, the youngest, was no stranger to work or gardening, and could spend all day digging a new root cellar and not think twice of it. She became the family’s timekeeper, keeping track of the passage of the days, months, and years. In 1978, a helicopter carrying a team of Soviet geologists flew down the Lykov’s remote valley while looking for a place to set up a base camp in order to prospect for iron ore. The pilot was surprised when he spotted a large clearing on a hillside, which was unexpected in such a remote area. As he flew over, it became obvious that the ground was cultivated. After establishing a base camp in the area, the small team of geologists made contact with the Lykov family. It was the first outside contact the family had with anyone in 42 years. During conversations with the team of geologists, Karp Lykov stated that one of the things which they did without, and which they really wished they had over the years, even in times of plenty, was a supply of salt. As of 2012, only Agafia, the baby of the family, still lives, and she is now 69 years old. Even though she has a harder time getting around now due to age, she still refuses to leave her family’s homestead. The local communities, though, still makes sure she has food, fuel, and someone to stop by on occasion and give her a hand with her garden.